PSI Molded Plastics' new 9,000-square-foot paint facility enables the company to apply shielding to parts as large as 4 feet by 5 feet on a controlled, mechanized line. Photo courtesy of PSI Molded Plastics East, Wolfeboro, N.H.
WOLFEBORO, N.H.–PSI Molded Plastics East, a specialist in large-to-medium, complex molded products, recently added a new mechanized production paint line that significantly expands its in-house electromagnetic interference (EMI) and radio frequency interference (RFI) shielding capabilities, the company said in a press release. 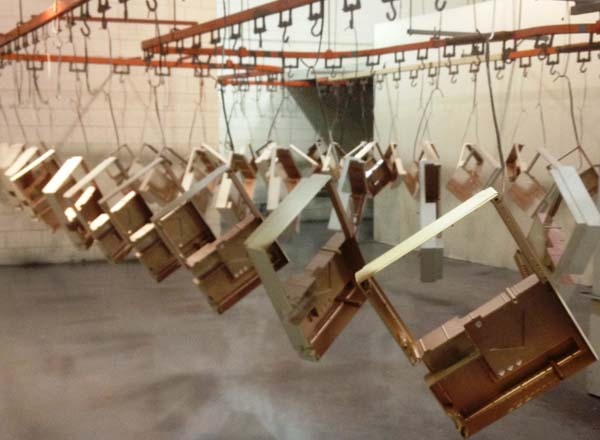 With its paint line, PSI East (www.psimp.com/psi-east.html) applies a copper shielding emulsion onto plastic molded parts to eliminate EMI/RFI penetration that could disrupt sensitive components and circuits in electronic equipment and potentially throw off instrument calibration. The shielding is also used to eliminate emissions from healthcare instruments that could interfere with other patient care equipment and affect patient safety, the company said. By running two shifts per day, five days a week, PSI East's paint operation can accommodate customers' increased throughput. The new 9,000-square-foot paint facility enables the company to apply shielding to parts as large as four feet by five feet on a controlled, mechanized line. The line has four drafted booths for priming, painting, coating, and texturing operations, along with an in-line convection oven. PSI East can apply spray-on EMI and RFI shielding onto most substrates. Conductive spray-on material is a more cost-effective option than large, heavy sheet metal liners or sheet metal enclosure doors, the company said. Spray-on shielding reduces the number of parts used on instruments, eliminating the cost of a box within a box and associated attachment parts. This, in turn, reduces overall product cost. The availability of in-house shielding capabilities is a benefit to customers who want to keep the entire process–from molding plastic parts, to finishing processes, to coating, painting, and decorating–under one roof to control quality and production time.